It’s Friday so you purchase some quality flower to help relax. But you unwind too much and leave the jar open over the weekend, only to find stale, flavorless flower come Monday. Maybe you store a top-shelf cartridge in your pocket, forget it’s there, and break it when you sit. Or you leave a piece of chocolate in its foil wrapper where it melts from sun exposure. While stale bud, leaky cartridges and melted chocolate aren’t the end of the world, it’s really annoying to waste your hard-earned money at your local dispensary or on cannabis delivery. You want the most out of your investment. You may not realize this, but proper cannabis storage can keep your products fresh, potent and tasty. They, like fresh produce, are also susceptible to degradation. Taking a couple of simple precautionary steps will ensure your edibles, flower, pre-rolls, concentrates, vape carts, tinctures and topicals stay fresh and effective ‘til the end! Here we’ll give you some tips on how to get the most out of all your cannabis products. In the end, it’s better for your bank account and body. Natural forces can really do a number on cannabis quickly. Beyond the physical alterations, factors like heat, air, and UV rays can actually lead to cellular changes that modify potency and effects. Cannabinoids, the vast chemical compounds found in cannabis like THC and CBD, can synthesize into other forms. Many cannabinoids are stored as acids, which aren’t “bioavailable” without heat. Cannabinoids like CBC (Cannabichromere) and CBG (Cannabigerol), which we don’t know much about, are synthesized from their acidic versions (CBCA and CBGA) when they come into contact with heat. One of the most consequential examples of cannabinoid synthesization is THC, the cannabinoid that makes us feel high. THC becomes bioavailable when THCA, a non-psychoactive cannabinoid, is exposed to heat. But that’s not the final act. When exposed to light and air, cannabis is synthesized into CBN, a cannabinoid known for making you very sleepy. Synthesizing THC to CBN isn’t necessarily a bad thing; some may even benefit from CBN. If you deal with sleep disorders or pain due to inflammation, CBN’s sedating and anti-inflammatory properties could do the trick. Just be aware that, typically, the higher the CBN level, the lower the THC and psychoactive effects. Yet if you buy cannabis with a certain THC level and want to keep it that way, storing the product properly will help preserve its potency, texture, flavors and effects. Generally, the most important natural forces to consider are light, temperature, air, and moisture. Improper levels of any of these can lead to changes in taste, potency, safety and, as mentioned, even cannabinoids. Failing to stash a strain properly can alter its effects and potency. UV rays, specifically UVA and UVB, are undoubtedly powerful. UVB can break down THC, which can lead to a drop in potency. Protecting your flower from this demise is as simple as buying a couple of UV-protected jars and storing them in a dark, cool place when not in use. Cannabis should be stored somewhere relatively cool (60°-70°F) and dry. Heat and moisture can produce mold, which can be very dangerous to inhale. But it can’t be too cold! Cannabis, especially flower, should never be placed in the fridge or freezer. These frigid temperatures will cause the trichomes, those little hairs that make buds look frosty, to separate. Losing trichomes means losing important cannabinoids and flavors. In general, cured and processed cannabis should be exposed to as little oxygen as possible. Too much O2 can cause rapid cannabinoid deterioration. As we mentioned, oxygen is responsible for synthesizing THC to CBN. Oxidation will produce a less potent “high” than cannabis products kept in airtight containers. Those UV protective jars above are great because they have an airtight seal and block harmful rays. Too little humidity can lead to crunchy, unappealing cannabis that lacks flavor and potency. Sounds gross, right? On the other hand, too much dampness and lack of airflow can create a breeding ground for mold and bacteria. And as if that isn’t enough, too much humidity and stale air can really ruin the flavor of cannabis by introducing too much ammonia to the chemical equation. Neither is great, though there are easy ways to regulate moisture in your cannabis jars, pre-rolls, and edibles so you have no excuse! Simply buy freshness packets to store in the jar/pack/pouch to help regulate moisture, avoid mold and flavor degradation. Nowadays, we have cannabis-infused versions of just about everything: cold brew coffee, truffles, dried fruit, potato chips, granola–the combinations are virtually endless. Because of this, each edible type comes with its own shelf life and storage needs. On top of that, many come with more than one dose, so proper cannabis storage is necessary if you want to maintain freshness until the next dose. The number one rule when it comes to edibles: pay attention to the packaging. With such variety their needs vary, so check for shelf life info like sell-by/expiration dates, refrigeration instructions and how long a product will last after opening. If you can’t find any of these details, ask your budtender or contact the brand for advice. If you don’t spread infused butter or olive oil on your daily toast, stow in the freezer instead of the frig. Just be sure to use the rest in six months or risk it going rotten. Refrigerate drinks, candy bars and baked sweets unless consumed in one sitting. Don’t like them ice-cold? Let chocolates, cookies, cakes and krispy treats sit out for five minutes to reach room temperature or risk cold, hurt teeth. Unlike baked goods, most chocolate bars don’t come in resealable packaging, so also put them in an airtight sandwich bag to prolong shelf life. More popular infused snacks like chips and popcorn already come in resealable bags; those that don’t, place in an appropriately sized ziplock bag. Regardless of the packaging, keep them anywhere it’s not very hot or cold since they don’t require refrigeration. As for gummies, most are also already packaged in reclosable bags or child-proof plastic bottles. Refrigeration won’t do any harm, though you’ll do more chewing, so put them in a cool, shady place like a drawer or cabinet. We can’t overstate the difference proper storage can make on cannabis flower and pre-rolls. Flower easily deteriorates when exposed to oxygen, humidity and UV rays that can lead to lackluster flavor and effectiveness. If you left a fresh nug or joint out on the counter, it wouldn’t be worth consuming within two weeks. But with the proper cannabis storage techniques, flower and pre-rolls can last up to six months or longer! That’s a huge difference in shelf life for very little effort. First, let’s discuss the best containers for storing cannabis flower. Here’s a little-known fact: the static electricity in plastic bags can actually make marijuana less potent by attracting the trichomes away from the buds and to the walls of the plastic bag. These trichomes are full of cannabinoids and terpenes, both essential to the potency and flavor. If plastic bags are part of your current storage technique, now’s the time to invest in some UV-blocking glass jars. Now let’s talk temperature. Proper conditions will ensure your cannabis doesn’t dry out or grow yucky organisms like mold and bacteria. These gross critters thrive above 77°F, so always stash your bud in a cooler environment and away from direct sunlight, preferably 60°F to 75°F. This can be as simple as keeping a jar or pre-roll pack/tube in a desk drawer in a shaded part of your home. And if you want to be extra cautious about moisture levels (and you should), invest in some freshness packs to extend their shelf life. But, whatever you do, don’t store your cannabis flower or joints in the fridge or freezer. While a very short stay in either isn’t necessarily bad, storing flower in very low temperatures for an extended time can cause the trichomes to fall right off. Concentrates have taken the cannabis world by storm. Similar to edibles, there’s a huge variety available made using different extraction processes, resulting in distinct textures and effects like sugar, shatter, budder, resin, and crumble. Unlike flower, these concentrates offer more potent effects, a cleaner high, and arguably more complex taste. However, improper storage can be detrimental to these positive characteristics. Concentrates are one of the easier products to preserve, lasting three to six months or longer when properly stored. Concentrates like sauce, butter, and crumble typically come in thick glass jars while others like shatter are packaged in small plastic cases (like SD cards) or paper envelopes with the product wrapped in parchment paper. Regardless of their packaging, don’t leave them exposed to the air when not in use. If you want short-term storage and transportation, purchase an airtight silicone container to keep your preferred concentrate(s) free of debris, deterioration, and harmful UV rays. Proper storage is a matter of function as well as preservation. Vape carts should also be placed in a cool, dark locale to preserve potency and flavor. Beyond that, tossing one around haphazardly or storing it horizontally (unless in the manufacturer’s case) can lead to annoying mishaps like leaking and clogging. Unfortunately, most cartridges are made from plastic and thus relatively easy to break; the components are so small it isn’t hard to get a clog. And when you pay $50-$60 for a top-shelf one, being careless with care can really hurt your wallet. Keep in mind that pyrex and metal cartridges are less likely to break since the material’s stronger. Whenever your battery pen isn’t in use, unscrew the cartridge to avoid any unnecessary heat. Then store it upright with the mouthpiece facing up; keeping the oil down by the wick won’t cause clogging near the mouthpiece. Plus, you won’t have to wait for the oil to flow back down towards the heating element. Want portability? Invest in a vaporizer that comes with a padded carrying case. Here’s an extra tip for clogged cartridges (they’re more common than you think): many top-shelf brands use more natural ingredients like honey in their concentrates. This can cause the oil’s viscosity to fluctuate, sometimes resulting in jamming. But before you give up on a vape oil cartridge try thinning the oil with a little heat using these two methods. Take small, rapid puffs while plugged into the battery to get the heating element fired up or simply roll the cartridge between your hands quickly to create friction. Now you’re heatin’ up! If this was a competition, tinctures and topicals would be tied for easiest cannabis storage. Generally, tinctures are a supremely underrated form of consumption. Not only are they a very discrete non-smoking option that can be added to nearly any food or drink, they have a two or three-year shelf life if stored right! That might sound crazy, but tinctures are incredibly stable due to the alcohol extraction method most commonly used to make them. So, as you might guess, tincture storage is pretty simple. Whether it’s olive oil, vegetable glycerin or something else, it’ll preserve easily. All you need is one of those UV-protected bottles or jars kept in a cool, dark place. And as if that isn’t easy enough, virtually all tinctures already come in UV-protected packaging. Storing topicals is pretty much a no-brainer. These can easily have a shelf life of one to two years if stowed properly — since storing topicals is so easy, you shouldn’t have any problems. Whether an oil, lotion, salve, spray, balm, or cream, they’re all made to be stored in a bathroom or medicine cabinet like the rest of your ointments and other medications. That means the materials used to emulsify and mix into topicals are, for the most part, completely shelf stable. And just like tinctures, virtually all topicals come in UV-protected and airtight packaging. Still, the normal rules of cannabis storage still apply. Keep your topicals in a cool, dark place; don’t let them sit in the car during a hot summer day or in the freezer when the AC is on the fritz. Generally speaking, a bathroom or bedside drawer are great spots to store. Sadly, when it comes to packaging, not all brands are created equal. Some may look very visually pleasing, but just doesn’t offer the level of protection needed to keep what’s inside fresh. Here are some concentrates, carts, flower, pre-rolls, and edibles that are just as potent as they are protected. Look for concentrates that come in small and sealable glass jars or syringes rather than just parchment paper and a Ziplock bag. Both Heavy Hitters and Alpine Vapor make some pretty cool small syringes filled cannabis distillate and oil, respectively. These can be easily be stored upright and will limit the concentrate’s exposure to unnecessary air. Invest in one that comes with a nice, padded carrying case like this one from AbsoluteXtracts. For a disposable vape option, try a dosist pen. While these pens are made of recycled plastic, they’re incredibly well made and aren’t likely to leak or break. Why? The entire cartridge, except a small window to gauge the level of oil, is encased in a strong plastic shell. When it comes to flower and pre-rolls, invest in brands that package their products safely and correctly to maximize shelf life. Flow Kana packages their flower in UV-protected, amber glass jars. Ganja Gold houses their individual flower/wax/kief tarantula pre-rolls in sturdy, airtight plastic doob tubes. THC Design shrink wraps their Classic J’s tins containing six joints, each with its own molded placeholder, covered by a Boveda humidity pack and thin paper sheet. Most infused foods, unfortunately, aren’t made with storage in mind, especially those that come with multiple doses like a chocolate bar or baked good. If you’re like me and often find yourself with more, there are a few options. One option: buy edibles with resealable packaging. Korova stores all of their bars and cookies in tricky-to-open, UV-protected, resealable plastic pouches. If dividing one is too much trouble or sweets aren’t for you, try Milo Confections single serving mints. They provide the exact dose you want and fit in your pocket or purse. Just pop one or two out of the tin whenever you need relief! Do yourself a favor and stash your cannabis where it’ll keep fresh! It’ll last longer, keep its flavor and potency, and remain free of mold and other harmful bacteria. 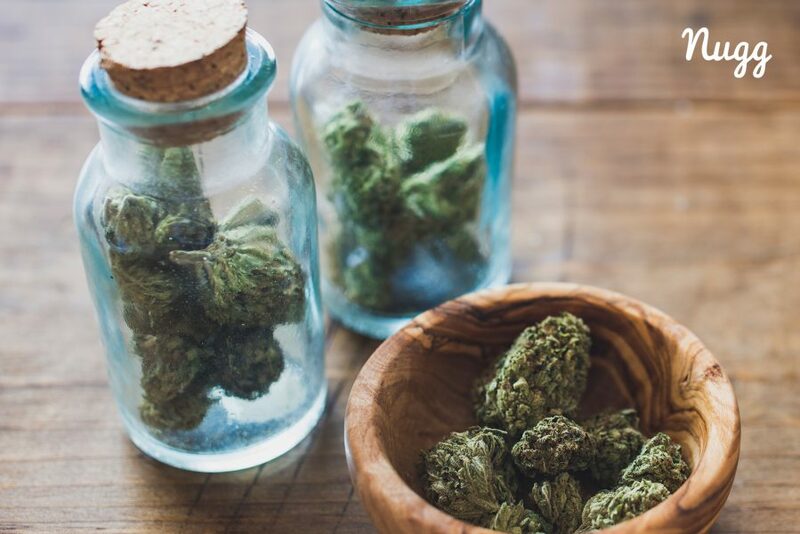 When it really comes down to it, cannabis storage is as simple as keeping a UV-protected jar or ziplock bag in a cool, dark drawer. Sounds easy enough, right? If you’re curious about the best way to store your favorite or new product, consult Nugg’s cannabis concierge service. Our team of experts can give you the most up-to-date info on how to seal your stash, maximizing flavor and potency for weeks to come.